I’m so excited to share our farmhouse master bathroom makeover with you! I’ve never painted or even decorated this room in the 10 years we’ve lived in our house! The bathroom is functional…it’s just not really our style. There are several things I’d love to change but wanted to keep within a budget. Since there are more things I love about the room than things I would change I decided to freshen up the space without spending a lot of money. I wanted to give the room an updated airy farmhouse feel to brigtening up the space. The first thing I did was paint the room. 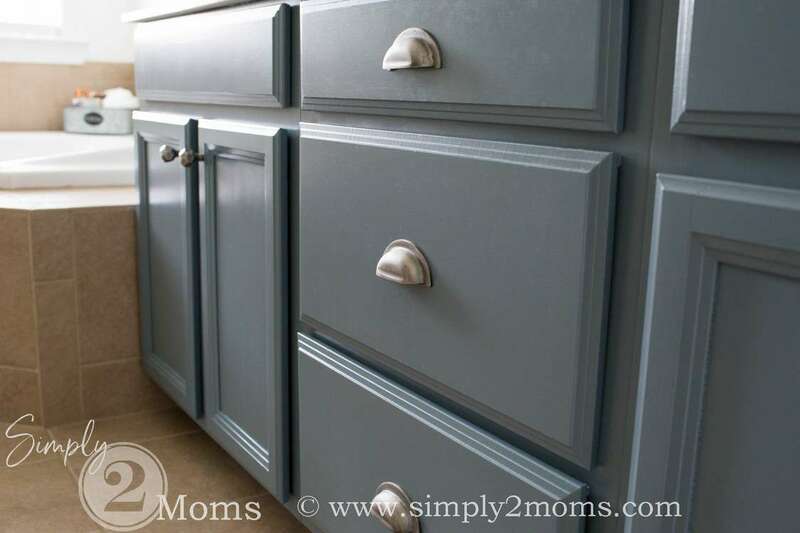 I spent years with different colored paint swatches on those walls hoping inspiration would come to me! I had a hard time choosing a color that would go with the brown tile. That brown tile is probably the worst feature in the room! But since I wasn’t going to replace it I had to find a color that would work with it. White walls was the perfect solution to keep the room light & bright! 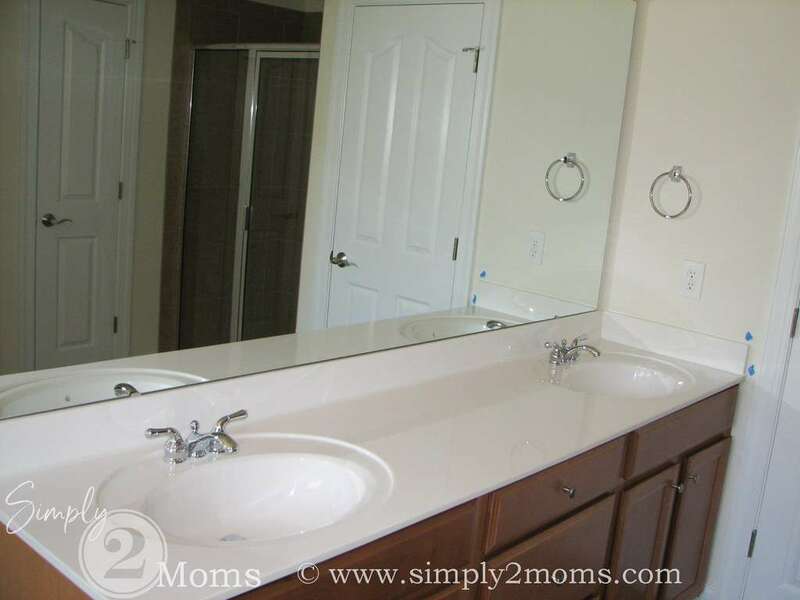 The bathroom had a large builders grade unframed mirror that spanned the entire vanity. 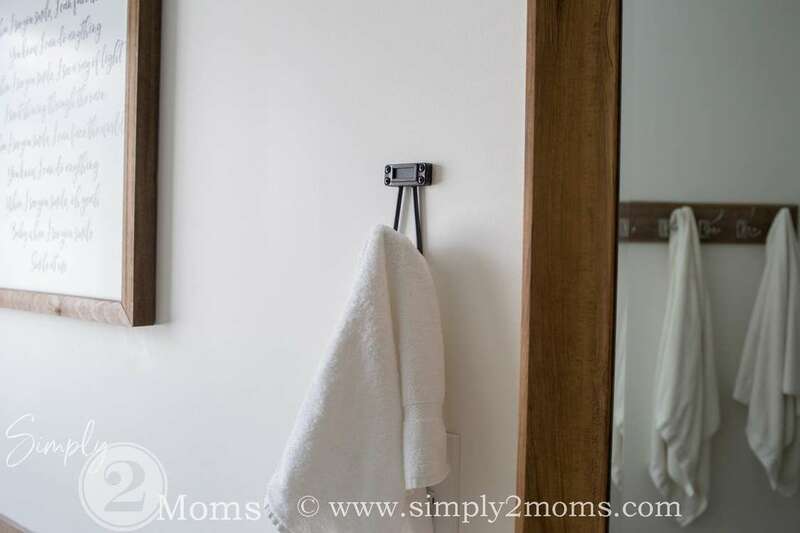 I had replaced the large single mirror with 2 mirrors when I updated the kids bathroom and I loved how it came out… so I deciced to do the same in our master bathroom makeover. I found these wood framed mirrors in my favorite home store….HomeGoods. 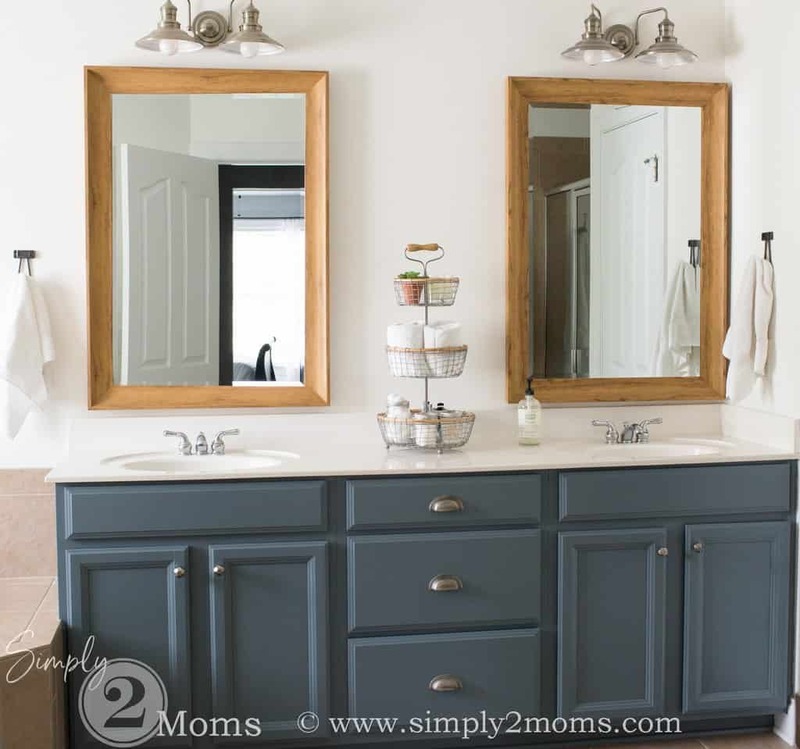 I love the color of the wood and how they contrast with the blue painted vanity. Another reasonable update I made was replacing the light fixtures. I’m slowly but surely updating all the builders grade lighting in our home. 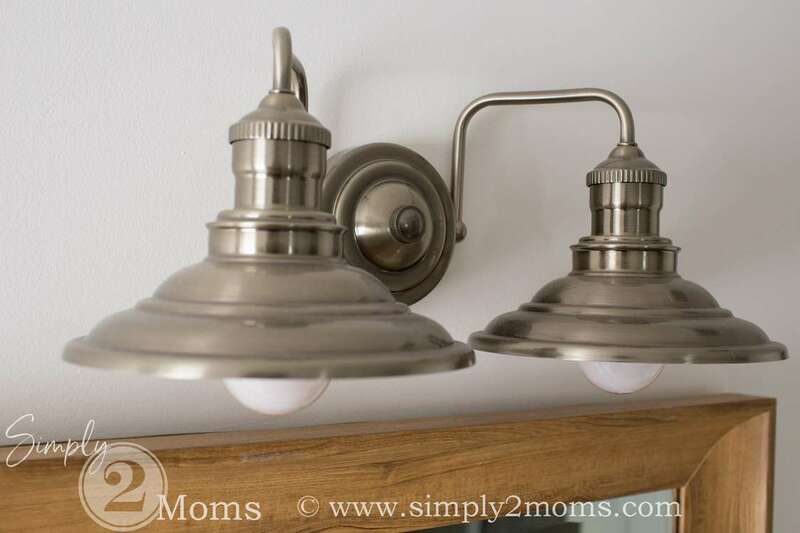 These new lights look great and go with the modern farmhouse style I was going for in the makeover. And they fit perfectly in the space above the new framed mirrors. Once the painting, hardware, lighting and mirrors were updated all that was left to do was add some accessories. 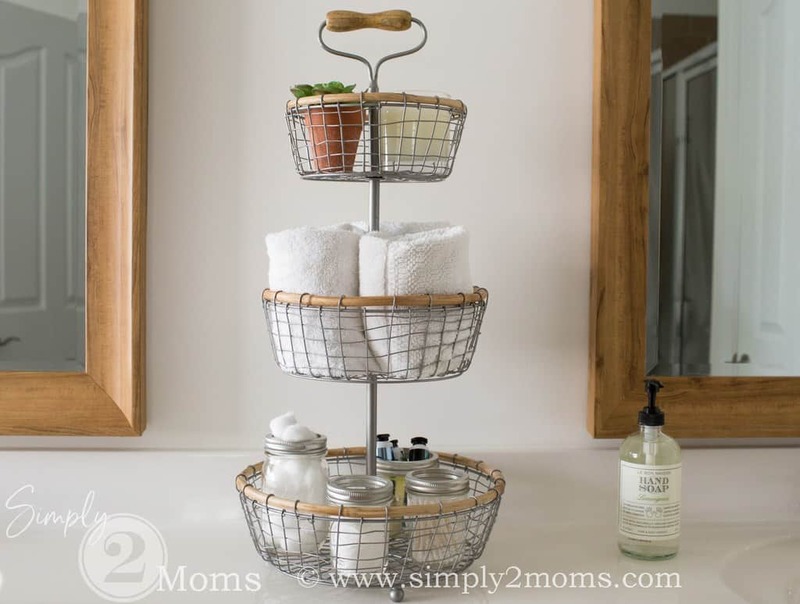 I found a great rustic tiered basket to hold our everyday essentials plus a few pretty things. 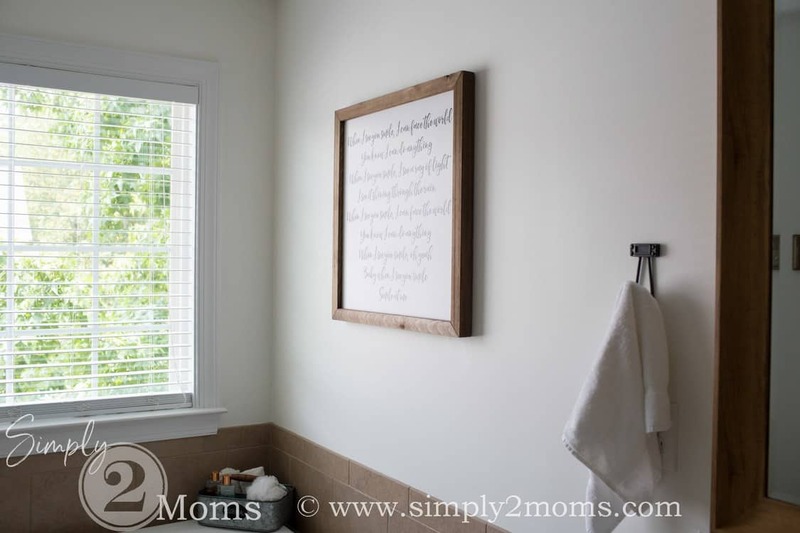 I love how the wood details on the basket coordinate with the wood framed mirrors. Unfortunately, Pier One doesn’t carry the same exact piece but this is another similar option. 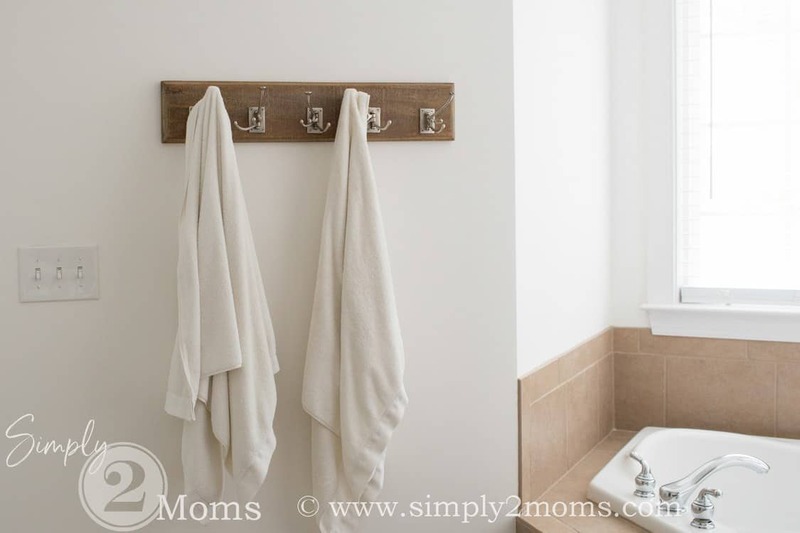 I really wanted to add some chunky rustic wood shelves on the wall over the tub and decorate them with glass jars of soap and other accessories. But decided against it since the tub never…I mean never…ever gets used. The shelves would just be yet another place that collects dust! So I went with a practical and easy to keep clean piece of wall decor. I bought a wood framed sign with “our song” lyrics printed on it from Smallwoods. 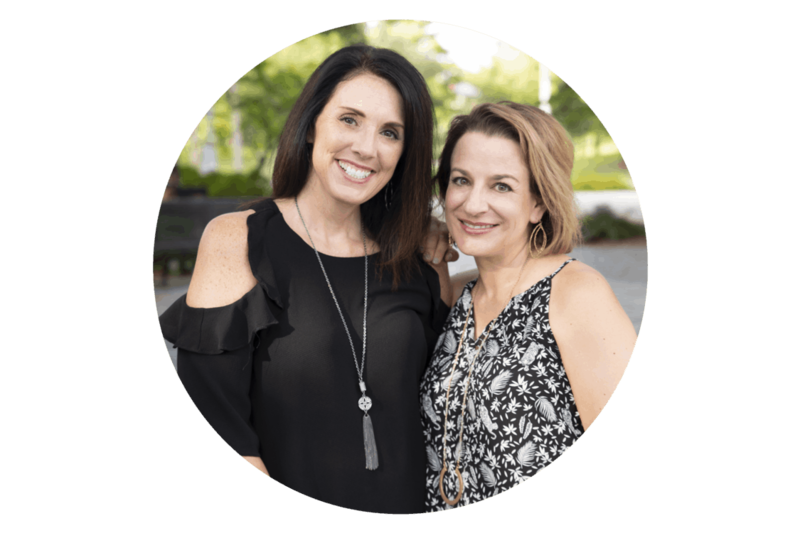 I wrote about all the signs in our home in this post. 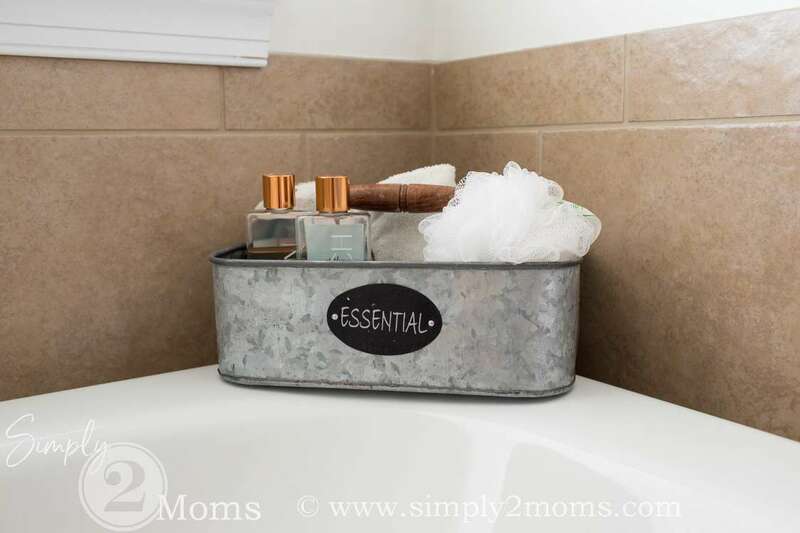 Finally, a gavalinzed bucket holds a few accessories and sits in the corner of the tub. I’m really happy with the outcome of our master bathroom makeover. I was able to update the space and bring in a bit of the rustic farmhouse vibe I love without spending a fortune on gutting the bathroom. 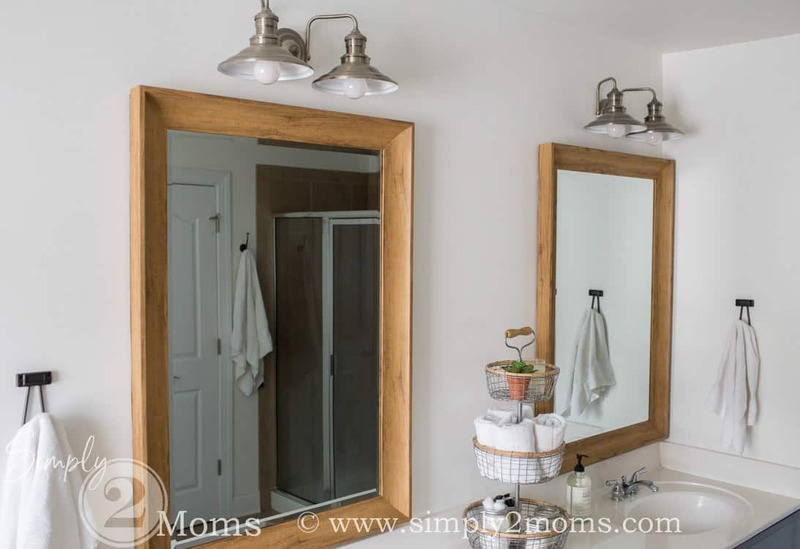 Painting the room white, adding wood framed mirrors, painting the vanity blue, replacing the light fixtures and hardware, and then adding some rustic accessories gave me the bright and airy farmhouse style I envisioned. It almost makes me forget about all that brown tile….almost! I’ve linked up to the TDC before & after party! One of favorites so far!! My inspiration for our downstairs bath! One of my favorites too! New tile would be amazing…but paint did the job for this makeover pretty well.